When it comes to medicine and treatment in the western world conventional doctors have put themselves and their patients into a bubble. Examining the body in only specific areas can cause traditional doctors to miss the big picture in the disease process. While conventional medicine is great for treating acute care and trauma it has trouble treating and preventing chronic diseases and persistent, undiagnosed symptoms. Treatments which work for some might not work with others and this is where integrative medicine comes in. By using non-traditional medicine and natural therapies integrative medicine is also able to incorporate state-of-the-art conventional medical treatments and therapies – the best of both worlds! Integrative medicine is a healing-oriented medicine which takes into account your whole person including mind, body, spirit, and community. It includes all aspects of your lifestyle habits and is patient-focused. With conventional medicine, also known in today’s world as Western medicine, doctors are mainly focused on certain areas of the body. This traditional type of medicine treats the signs and symptoms of disease through medication and/or surgery. Integrative medicine focuses on the bigger picture and incorporates an alternative approach as well as a conventional approach. This broad approach of integrative medicine aims to treat the full person – not just the signs and symptoms of the disease. Integrative medicine is now being recognized as a successful approach to addressing the chronic disease epidemic in our nation. Integrative medicine uses individualized treatment plans which best suits your needs and wants. With integrative medicine, it gives you empowerment through your own decision making in your treatment and care plan. Andrew Weil, MD played a major role in codifying and establishing the emerging field of integrative medicine. His focus on treating and caring for the whole person integrates scientifically-validated therapies of conventional medicine with complementary and alternative medicine (CAM). The broader concepts of promotion of health and the prevention of illness as well as the treatment of disease. Integrative medicine and functional medicine have similarities which overlap each other, but they also have distinct differences in their approach to treatment and care for the patient. Both integrative and functional medicine focus on your whole body rather than just the signs and symptoms of certain diseases. While integrative medicine is a holistic medicine approach with patient-centered care, it does take into account conventional health care practices to diagnose and treat patients. Integrative medicine looks at your overall health including mind, body, and soul to promote healing and wellbeing. With functional medicine, it also focuses on your overall health with the patient as its core focal point. But functional medicine incorporates a system-oriented medical approach which aims to identify the underlying root cause of a disease. For this reason, functional medicine will conduct genetic and environmental research on patients to understand the root cause of your disease. And functional medicine does not use traditional medicine therapies with its approach. These types of approaches can help prevent and reverse many chronic diseases such as cardiovascular and autoimmune diseases through non-traditional and natural treatment. Integrative medicine and functional medicine are both at the forefront of healthcare of the 21st century. Integrative medicine dives deeper than just the surface of conventional medicine. With the healthcare crisis we are dealing with in our economy today, integrative medicine is aimed to prevent disease and illness. I do this through integrative strategies which help you foster the development of healthy lifestyle habits to use throughout your life. Integrative medicine helps my patients get back to the basics of their health through alternative therapies while also having the ability to use conventional therapy when needed. Through integrative medicine’s mind-body-spirit community philosophy you aren’t just another number to me as with traditional doctors – your personalized care is what I value. I have over 15 years of experience in integrative and functional medicine. My main focus is helping you achieve health and wellness while working with your personal needs, values, and beliefs. 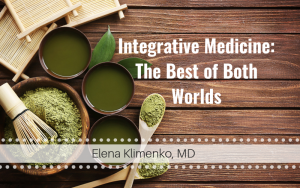 If you’re looking for an integrative medicine doctor in the New York City area request an appointment today with Dr. Elena Klimenko or call (212) 696-4325.